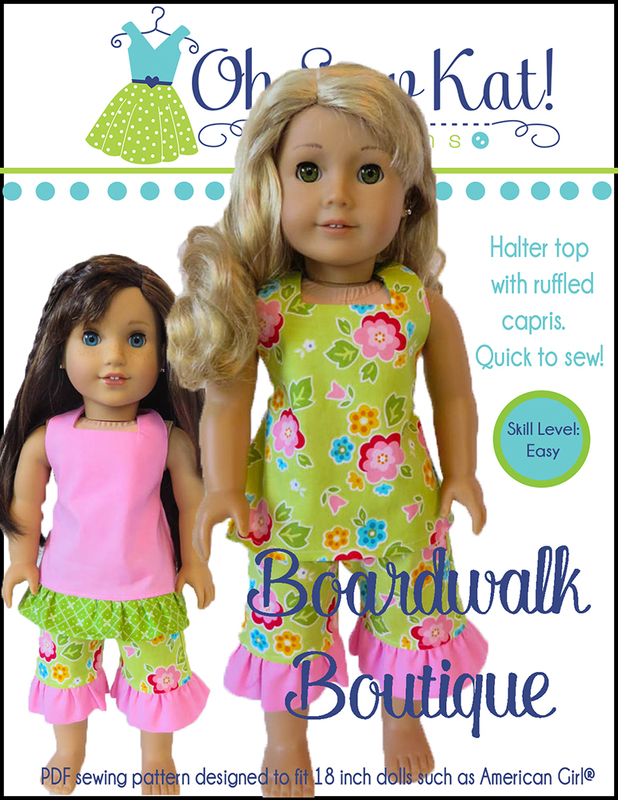 Sugar n spice – Oh Sew Kat! I do have an Irish heritage, and I’ve always loved it! March is one of my favorite times of the year, especially the shamrocks, and the music! Each year, I try to sew something shamrock themed for the dolls. This post shows the dresses I’ve made with the popular SUGAR N SPICE sewing pattern. It’s available in my shop in 3 sizes. The beauty of the Sugar n Spice pattern is versatility and value. With an underdress and overdress option, plus some extras like an apron, cape, corset, and tutu, the time you spend making solid underdresses is time well spent. Notice each of these next photos. They all have the same, light green dress as a base! I’m just changing up what is layered over it in each photo. See the Easter version HERE. 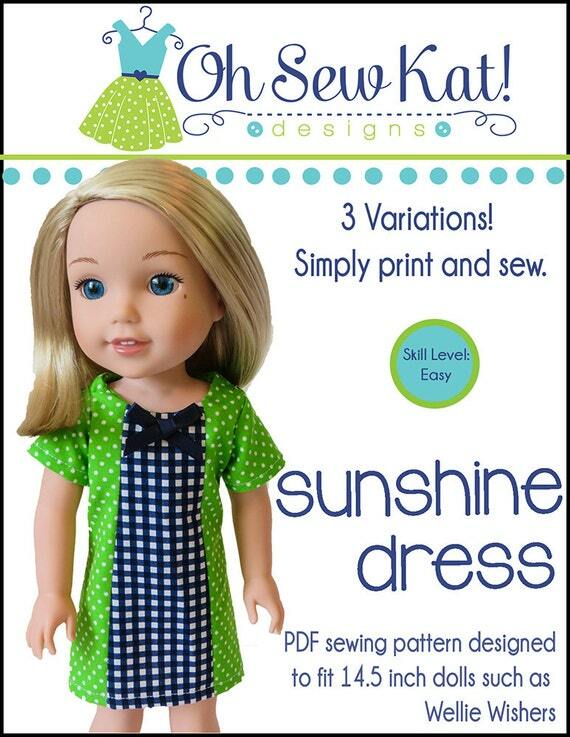 Willa is wearing her green dress with an overskirt using the EVERYTHING NICE accessories pattern. This little overskirt look is super quick and easy! Wear it frontwards or backwards like in this post. Yep! 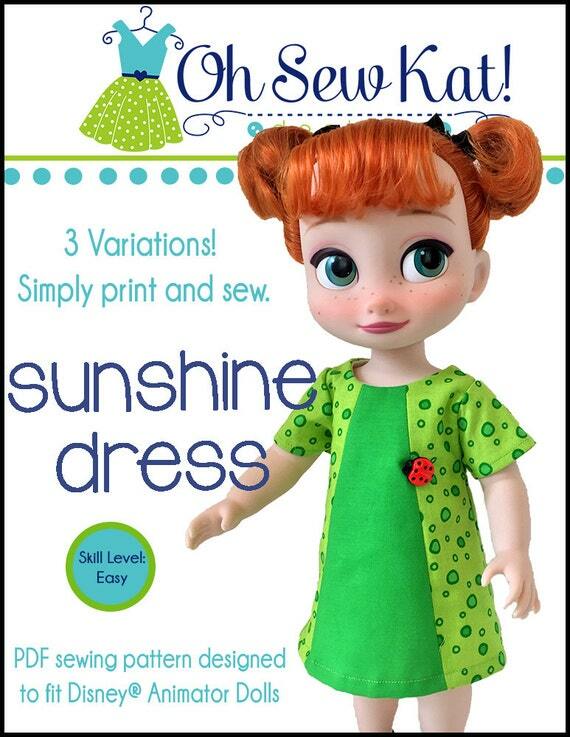 Same green dress- I added a seasonal overdress or pinafore, which is also included in the Sugar n Spice pattern. Just the right touch: a ribbon belt and a cute button. Now the green dress really shines! And here is one more from the same Sugar n Spice pattern. For this outfit, I took the pinafore/overdress from Sugar n Spice, and reversed it. 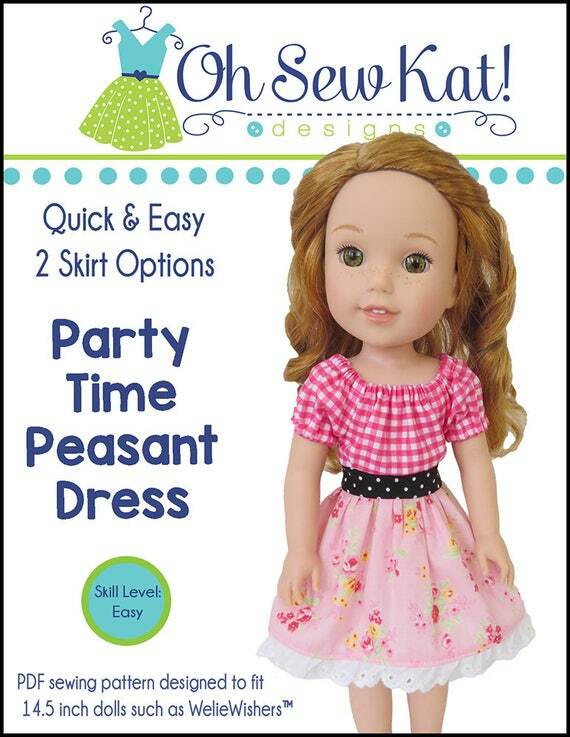 I left the edges of the skirt unconnected, and layered it over a Party Time Peasant Dress. Read the post about it HERE. 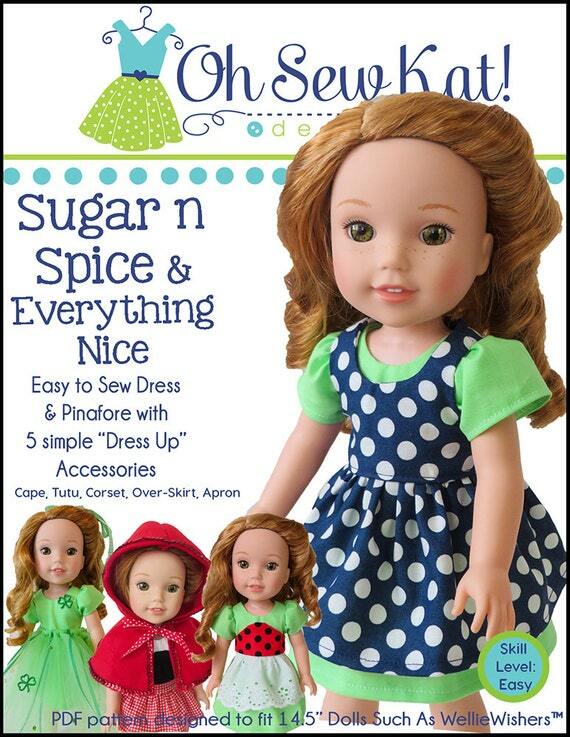 Find the Sugar n Spice and Everything Nice pattern HERE for 18 inch dolls. Wellie Wishers and Animators’ sizes are also available. 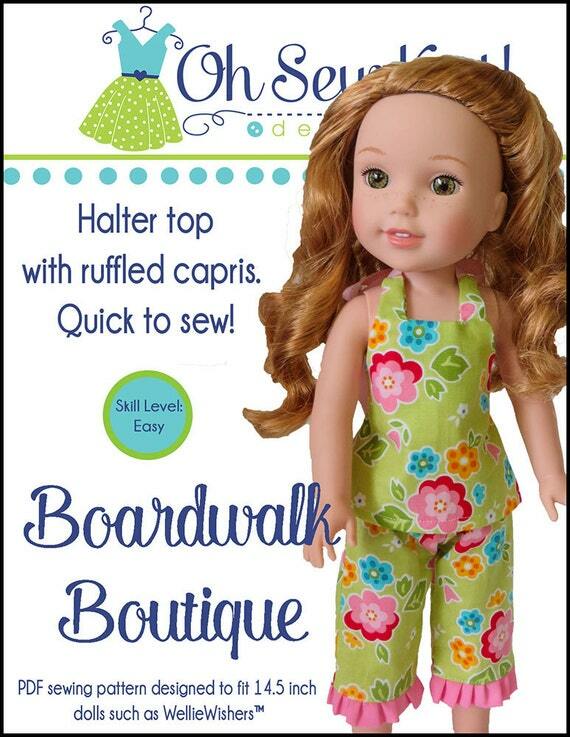 Put the LUCK OF THE IRISH into your doll’s wardrobe this month! 6 Dresses from One Pattern: Six Different Ways to Sew the Sugar n Spice Dress by Oh Sew Kat! 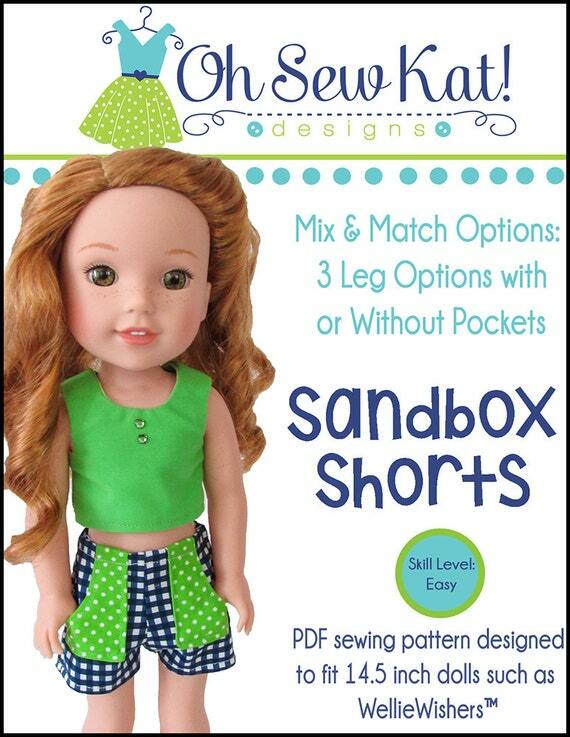 When you purchase a PDF sewing pattern from Oh Sew Kat!, you get more than just the look you see on the pattern cover. With a few tweaks and changes, (called pattern hacks), and some different fabric combinations, you can Step Up! your basic pattern into almost any look you can think of! Today, enjoy these “twists” on the Sugar n Spice Dress pattern. 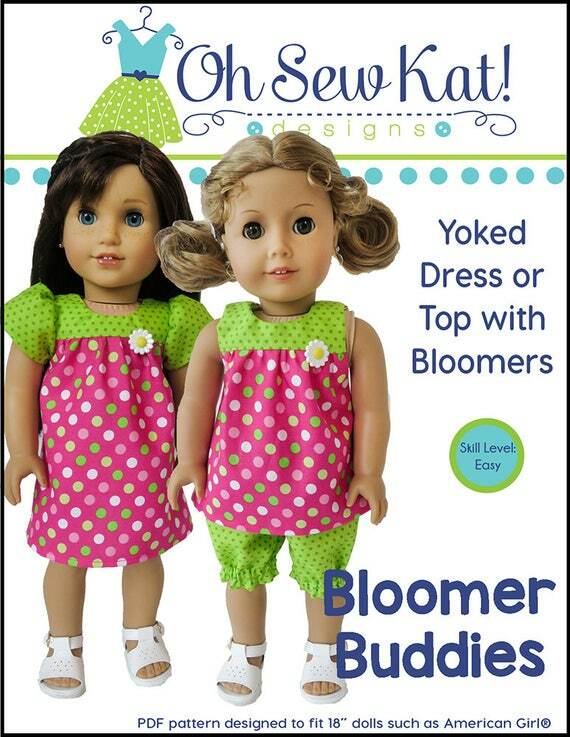 These outfits can be made for any size doll! 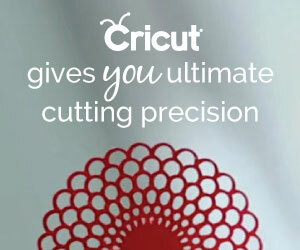 Find even more pattern hacks and tutorials on the Tutorials Page. 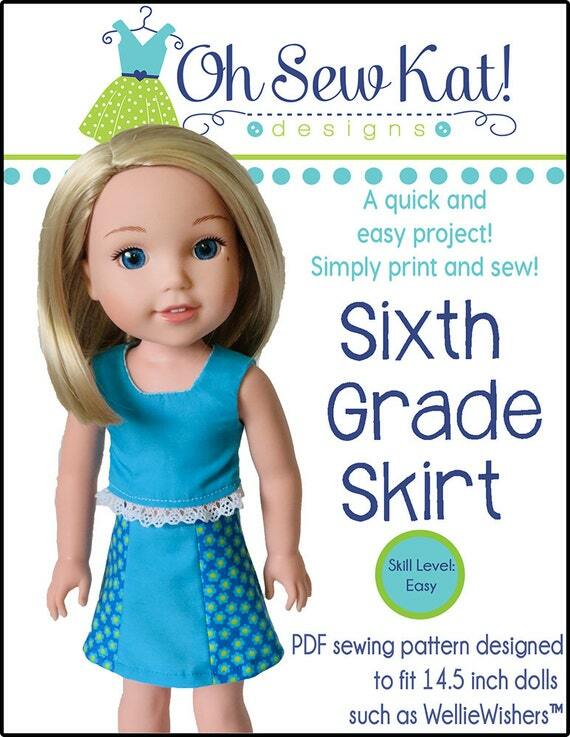 Create a classic holiday dress, similar to the one American Girl® made for the BeForever character, Molly McIntyre. I used a gorgeous green Kona cotton Sugar n Spice Dress, but the original dress was made of velvet and would be beautiful from that too! Add a little lace around the sleeves and neckline for a dainty touch. See more photos HERE. Every dress pattern can be made as a top, and every top pattern can be made as a dress! Use the Sugar n Spice bodice to make a cute peplum top! Find the tutorial HERE. 3. Every dress pattern can also be used to make a longer dress! Or a nightgown! For the holidays, make the Sugar n Spice Dress in white, and add some peppermint piping and pretty ruffles to make a nightgown that will have sugarplums dancing in her head all season long. Find the tutorial HERE. I also used THIS TUTORIAL to add the placket in the center front for the buttons. 4. And while you are thinking about making long dresses, why not try a fun Hawaiian print and make a MuuMuu style dress! These Sugar n Spice Dresses would be perfect for walking along the beach eating shaved ice! 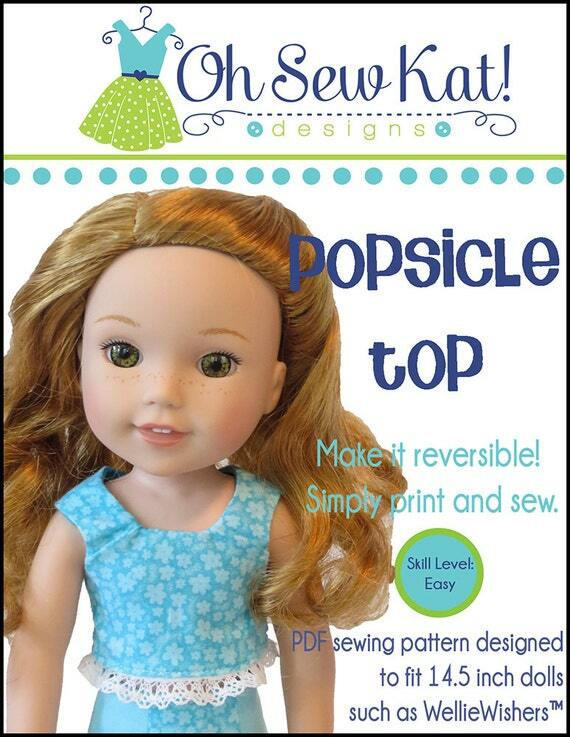 Use the overdress/pinafore pattern and THIS TUTORIAL. 5. Dress up the front bodice of the Sugar n Spice Dress with some tiny ruffles, trim, ric rac, piping, or lace. Use THIS TUTORIAL to add the placket, and tuck the trim in before you topstitch it in place. See more photos of these cute, bunny dress HERE. 6. The Sugar n Spice Dress was designed to layer a dress over a dress. But don’t stop there! 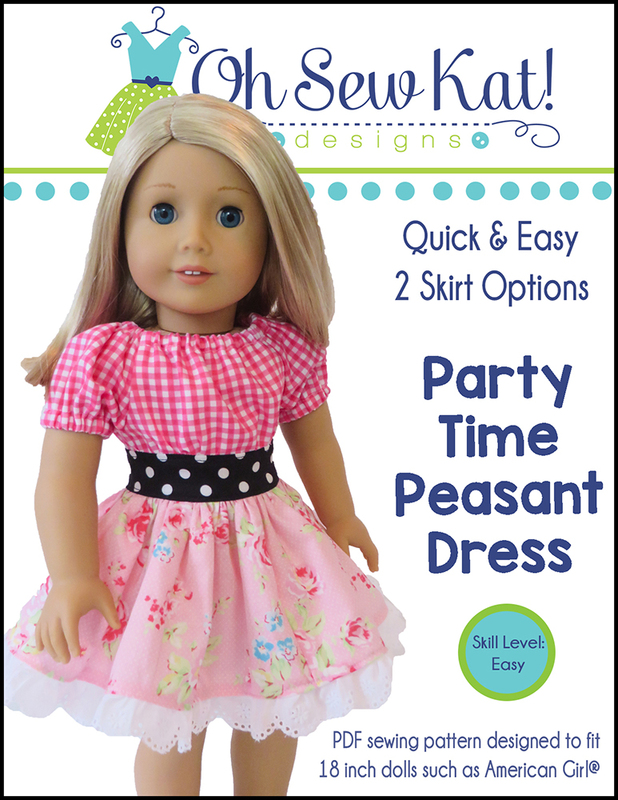 Try the overdress/pinafore over a Peasant Top or a Party Time Peasant Dress as I did here for St. Patrick’s Day. I reversed the overdress, lowered the neckline, and sewed the skirt on with a large opening for the underdress to show through. See more photos and details HERE. The Sugar n Spice Dress was designed to layer prints over prints over prints. Or to make solid dresses and change the aprons/pinafores for the season, like this Easter Dress and this one for Valentine’s Day. It was also designed to be a blank canvas to create any sort of character dress you can think of from Wonder Woman, to Princess Belle, to Cinderella and more! Visit the Inspiration Gallery to see even more ideas for the versatile Sugar n Spice Dress pattern.How will you make the Sugar n Spice Dress? Find the pattern for 16 inch Disney Animators’ dolls and 14.5 inch Wellie Wishers™ and Glitter Girls Dolls where Oh Sew Kat! patterns are sold. Molly’s father is a doctor, serving in World War II. Much of her story centers around her father being gone, and then coming home. You can find her books on Amazon here: Ad: https://amzn.to/2DkIlPD. 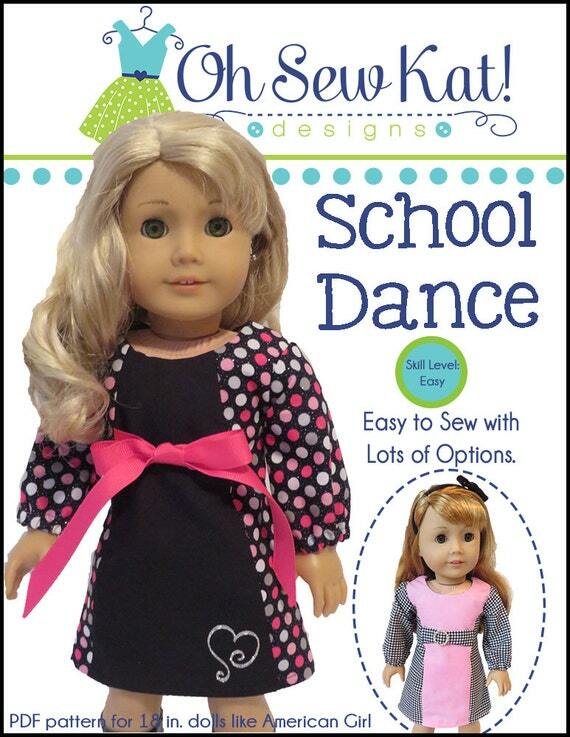 The Sugar n Spice dress is the perfect pattern to make a replica of Molly’s original holiday outfit. Molly’s was made with velvet, and I used a rich, Kona cotton. I made the dress according to the pattern, with just a shorter (pinafore length) skirt. If I was going to make it again, I might move the neckline up a bit, drop the waist by 1/2 inch and use a circle skirt instead of a gathered skirt, but I think you will agree, the dress sure looks pretty close to the original idea. I wonder what other patterns and styles can easily be adapted to fill out Molly’s 1940s wardrobe. Who else added Molly to their dolly family this year? 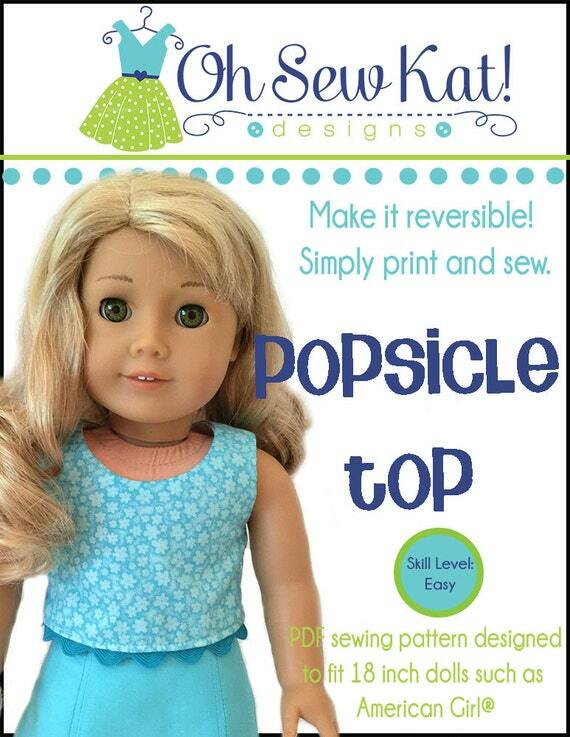 Get creative with your doll outfits. Think outside the box and mix and match the pieces in your doll’s wardrobe to create a different vibe! I made this Halloween themed Sugar n Spice pinafore from this fun fabric late last Fall. I never even took any photos of it. I pulled it out today, and had some fun dressing different dolls in it to see what kind of looks I could create. First up is Nicki. Nicki is wearing the Playtime Peasant Top with 3/4th sleeves and some fun, slouchy front black boots. (Side note/ Public Service Announcement: These boots left black marks on my Grace’s legs last year when I left her in them for a few weeks. They have been moved to the “photograph and remove pile” in my dollhouse! ) I also tried it with some fun tights and black Ugg boots. Next up is Kelly. She is wearing the same pinafore, over a Jumping Jack turtleneck shirt. With a pair of black leggings (made by American Girl) and her “chucks”, she’s ready for a fun, fall afternoon. Pair the pinafore with knee socks and mary jane shoes for a perfect Halloween party dress outfit. Finally, Luciana is wearing the full ensemble. The Halloween pinafore over a yellow Sugar n Spice dress to help the colors pop! 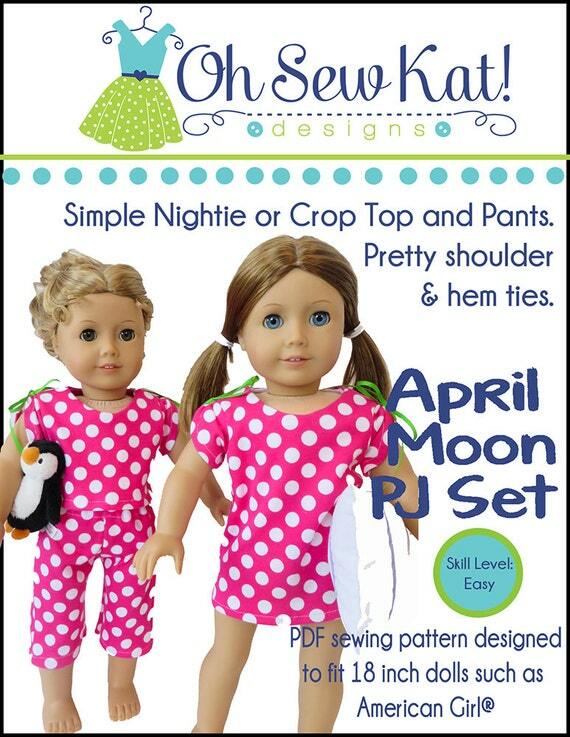 When you purchase the Sugar n Spice pattern, you get the patterns for the dress, the pinafore, and 5 “dress up” accessories to really let your creativity shine! Find the pattern HERE. 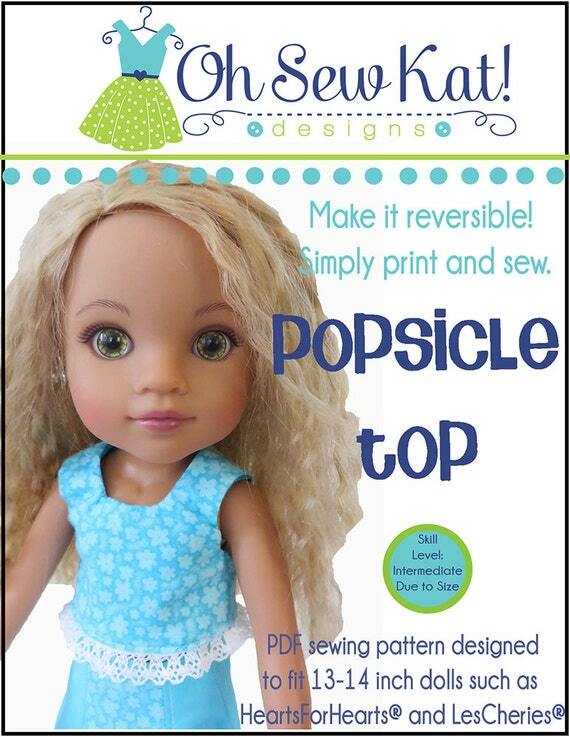 With one dress, you have all kinds of options to create different doll outfits for hours of doll playing fun. 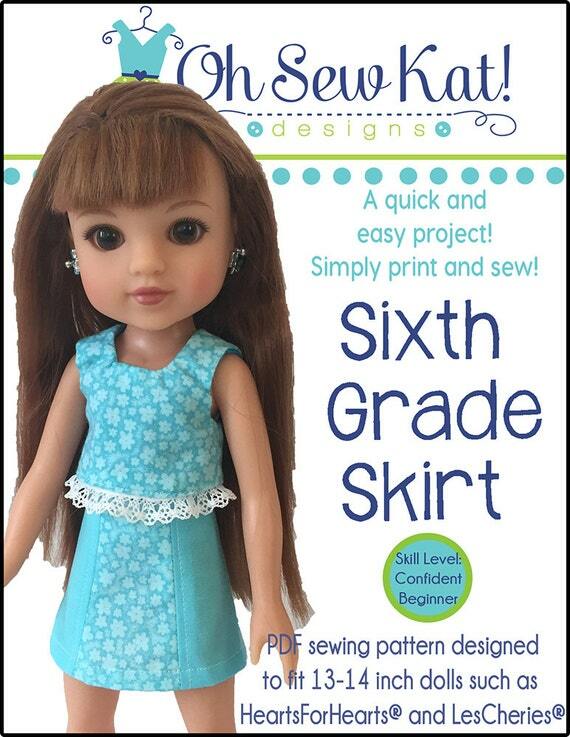 The Sugar N Spice pattern is a basic pattern to fill your doll’s closet with pretty clothes! 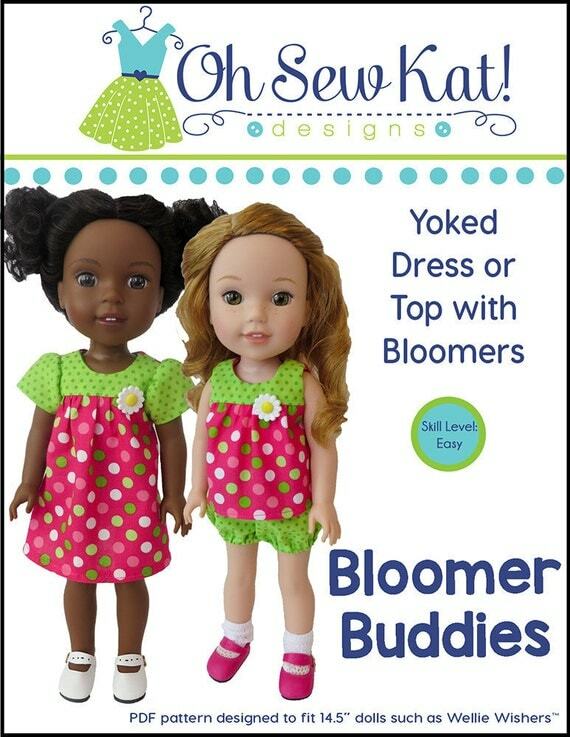 It’s also available sized for wellie wishers and disney animator dolls. See more ways to use this basic and simple pattern HERE and HERE.